There aren’t many things worse than a dirty and unhygienic workplace. Whether you work in an office environment, a customer-facing environment (such as a retailer), or if your workplace is a bar or a restaurant, there is nothing more destructive to a working environment than poor and unsanitary conditions. From dirty, sticky surfaces to unpleasant and foul-smelling odours, all of these things can combine to make your working life miserable. If you are miserable at work due to bad conditions, you’re unlikely to be very productive; and if you’re unproductive and unhappy, the chances are your customers aren’t going to be very happy either! Fortunately, there is plenty you can do to tackle unhygienic conditions at work. We live in an age of science and technology and so there are numerous cleaning products and innovative hygiene solutions available on the market. 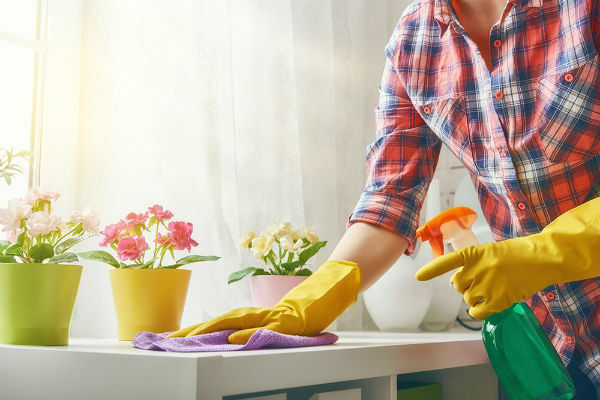 Here we take a look at some of the specific hygiene problems that people sometimes face at work, and the top five handy cleaning products that will solve some of those problems for you. When used everyday, bins can become extremely smelly and unpleasant due to all the rotting food waste that is placed inside them. This problem can be particularly bad in the summer months, when the warm weather and sunlight speeds up the decomposition process, releasing horrible malodorous gases into the air – think of co-workers’ lunch sandwiches for example, or rotting banana peels! When kitchen bins are emptied into outside bins, the problem is often simply transferred from one place to another – and a nasty smell is still left in the kitchen bin, even after being emptied. Bin-odour neutraliser will solve this problem for you. Simply spray or place the odour-neutralising substance inside the bins and the place will smell fresh as a country meadow again! Hand sanitiser is an extremely useful product to have in a working environment, as it prevents the spread of nasty germs and bacteria – which are the way cold and flu, and other diseases, are spread. Just think, in a large office environment, say, where workers could be moving around all day, shaking hands and touching surfaces and computers. Or in a kitchen environment, where staff are actively involved in preparing food for customers. These are situations where it would be advisable to have a good hand sanitiser available – and not just in the toilets – no-wash hand sanitisers are an increasingly common sight in modern workplaces and can be a very good investment in terms of reducing staff absenteeism due to illness. A good old-fashioned surface cleansing spray is an often-overlooked item in the workplace these days – but in terms of the results it obtains in improving workplace cleanliness, you could do far worse. Surface-cleansing sprays (such as kitchen or bathroom sprays) have traditionally required you to wipe the spray off with a damp cloth after a period of time. Now, however, this isn’t always necessary: there are numerous ‘no-wipe’ surface cleansing sprays available, which is especially convenient in an office environment – as you can simply spray and forget (this can be done regularly). In the modern office environment, PCs, laptops and tablets can become especially grimy and unhygienic due to their constant use. Again, this is a problem in terms of the transmission of nasty bugs and bacteria, which can cause illness and staff absenteeism – as well as just being generally unpleasant. Disposable screen wipes are available in handy long-lasting multipacks, so you no longer have to tolerate dirty and unhygienic computer screens and keyboards. For those nasty, long-lasting odours that seem to hang in the air, you could do far worse than to opt for a plug-in odour neutraliser. These devices fit conveniently into a plug socket, and will slowly release a pleasant and soothing scent into the surrounding vicinity. Plug-in odour neutralisers are often combined with essential oils, so not only do they smell very nice, they are good for you as well!